Mental disease is a horrific thing, both for those that suffer from it and for those that must suffer the afflicted, and certain forms of these derangements have grown in rate of occurrence to epidemic levels. It goes beyond what public health agencies can deal with along. Each and every one of needs to be on the look out for the mentally ill, lest they become a clear and present danger to themselves and/or others. Do you know someone suffering from Trump Unacceptance & Resistance Disorder (TURD)? Know the signs, spot the symptoms, and save a life. Trump Unacceptance & Resistance Disorder (TURD) is a pattern of pathologically dissociative and psychotic behavior, first observed in the late hours of November 8th 2016, and increasing in severity with passing time. Sufferers of TURD often exhibit extremely pronounced cognitive dissonance, sudden bouts of childlike rage, rioting and uncontrollable crying. Sufferers of TURD are characterized by a persistent unwillingness to accept that Donald Trump is going to Make America Great Again. If you have a friend or loved one suffering from TURD, urge them to seek treatment and stage interventions or report them to proper authorities if their disease has progressed past the point where they can voluntarily accept treatment. Together we can beat this scourge. 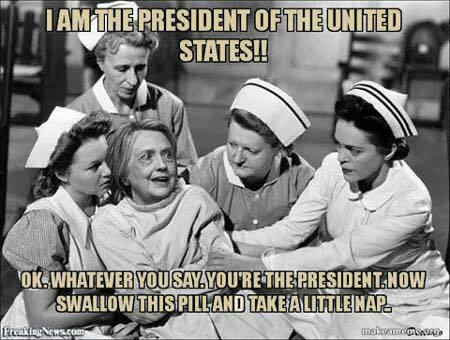 Yeah, I’d imagine that old Hillary is going away for a while for a bit of a rest now that Donald Trump has been inaugurated as the 45th POTUS.